Eagle Police are looking for whoever broke into two homes on Shalimar Drive in Eagle over the Christmas holiday and stole multiple guns, jewelry, a van, and several other items. The thieves stole a locked, 200+-pound gun safe from inside one of the homes that had 18 guns inside —including handguns and rifles. The safe was later located in a ditch on the side of the road near Middleton. The bottom of the safe was cut off and the guns were missing. Thieves took two guns – a rifle and a shotgun —from inside the other home as well. Neither family was home at the time of the break-ins. It appears the thieves broke into the homes, which are next to each other, through the locked glass back doors, likely on Christmas Eve. Detectives are trying to determine why those particular homes were targeted, but suspect it may have been thieves who were driving through neighborhoods looking for people who weren’t home for the holiday. 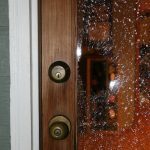 Officers began their investigation on Dec. 27 when one of the homeowners returned to find someone broke into and ransacked their house. Dresser drawers were turned over, with contents on the ground. Presents were unwrapped and empty. Jewelry was missing, along with a rifle and shotgun, from a bedroom. There were footprints all over the snow near the home. Detectives found out about the second home — next door but separated by a large common area — on Dec. 30, when an officer found an abandoned 2004 Pontiac Montana mini-van in the Legacy Subdivision, which is about 5 miles away from Shalimar Drive. Officers called the owner of the mini-van and quickly figured-out it was stolen from a home on Shalimar Drive. 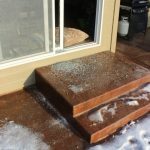 When officers arrived at the Shalimar home, they found the back door had been smashed in. They went inside and found the house ransacked — cupboard doors and drawers were opened and items were strewn on the ground. Several items of jewelry were missing. It appears the thieves picked up the gun safe (which would have required more than one person to move) from inside the garage and put it in the back of the mini-van, which they then stole. Detectives suspect the thieves drove the van to the Legacy subdivision, where they unloaded the stolen items (including the gun safe) to another vehicle and ditched the van. Eagle Police are actively working the cases and investigating leads. They would like to talk to anyone who has information or might have seen something unusual in the Shalimar Drive area in the days leading up to Christmas.